The GPA requirement for Honors students is a minimum of 3.0 at the end of each semester. The director will review the GPA of continuing students in January and May of each year. Students who fall below this requirement will receive a notification that they will be placed on a probationary period for one semester. Those who do not bring their GPA above a 3.0 after this period may not continue with the Honors Program. After the junior year, students who are still below a 3.0 will be ineligible to continue in the program. Successful completion of the Honors Curriculum. See our course listing here. The Senior Thesis Project is a two-semester project that integrates the major or majors and minors of each student. The topic is selected by the student who then selects one Faculty Sponsor and one Faculty Reader to assist him/her in researching and completing the project. The project can be completed through HNRS Independent Study courses. In some cases, student-faculty research or capstone courses in a major may be considered for partial fulfillment of this requirement. Seniors are required to present their thesis projects at the annual Symposium. If they cannot attend the Symposium due to studying abroad or early graduation, a poster must still be created to be put on display as a requirement of the project’s completion. Engaged citizenship in the Ramapo College community, the wider local community or socially engaged projects generally. General Meetings: Each student is required to attend the General Meetings at the beginning of each semester. These are not just vital for their information, but are a chance for us to convene as a community near the beginning of each semester. Academic Events: These events emphasize the principles of the Honors Program and develop and express the intellectual lives of the students associated with them. The goal of civic engagement within our program is not just to reach a certain number of hours of participation or dollars raised. We aim to dig deeper and target systemic problems within our community to change them at their root cause. Each student should perform a minimum of ten hours of community service per year or make an equivalent contribution to a worthy cause. 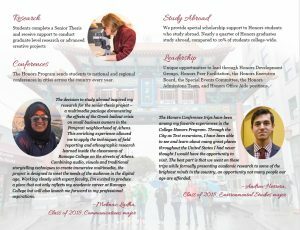 These events facilitate collaboration between the Honors Program and the outside world, including the surrounding community. We will communicate and coordinate service opportunities on and off campus throughout the year. An Honors Development Group is a group of 7-10 Honors students with two upperclassmen leaders that meet on a weekly basis. Their purpose is simple: to make the transition into college and/or into the Honors Program as seamless as possible by surrounding you with supportive peers and presenting you with various opportunities to get involved. Students in each new cohort are assigned to an HDG based on the availability within their class schedule. HDGs participate in a variety of activities throughout the year to help students make friends, become acclimated to campus, and feel a part of the Honors Program. Some activities that an HDG might partake in include watching movies, discussing an in-depth topic, visiting various parts of campus, playing board games, doing scavenger hunts, decorating the Honors Lounge, and much more. Your HDG leaders are upperclassmen who have gone through a comprehensive training program before leading. Ramapo College Honors Program students are not required to study abroad but are greatly encouraged through a distinctive and diverse curriculum to pursue intercultural, international and experiential learning in their field of study. Visit our “Study Abroad” page for information on studying abroad with assistance from the Honors program.